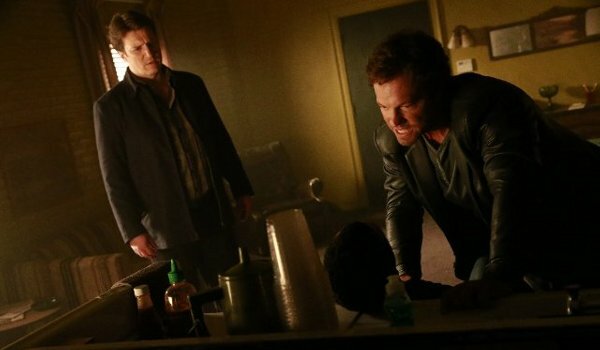 In an episode that doesn't feature Beckett (Stana Katic), Castle (Nathan Fillion) is approached by his "old friend" Detective Slaughter (Adam Baldwin) to look into the heist of a prototype microchip. When Slaughter's informant turns up dead Ryan (Seamus Dever) and Esposito (Jon Huertas) turn their attention to Slaughter as the number one suspect, but Castle chooses instead to believe the detective's innocence even going so far as to steal Ryan and Esposito's car to prevent them from taking Slaughter in for questioning. "Cool Boys" starts off a bit slow but as the mystery begins to unravel and Castle is forced to choose between believing or condemning his "partner" things pick up. The mystery into the theft of the microchip eventually leads the pair, with Ryan and Esposito always a step or two behind, to a young genius with a troubled past and those who decided to take advantage of his brilliance by turning one of his inventions to crime in order to not only make a big score but also as a statement of a new high-end heist crew in town. Eventually Castle and Slaughter get their killer, but our protagonist is still no closer to reconnecting with his wife who doesn't make so much as a cameo in the episode.